Eva Papamargariti’s practice focuses on time-based media (video, gif animations), printed material and installations that explore the relationship between digital space and (im)material reality. 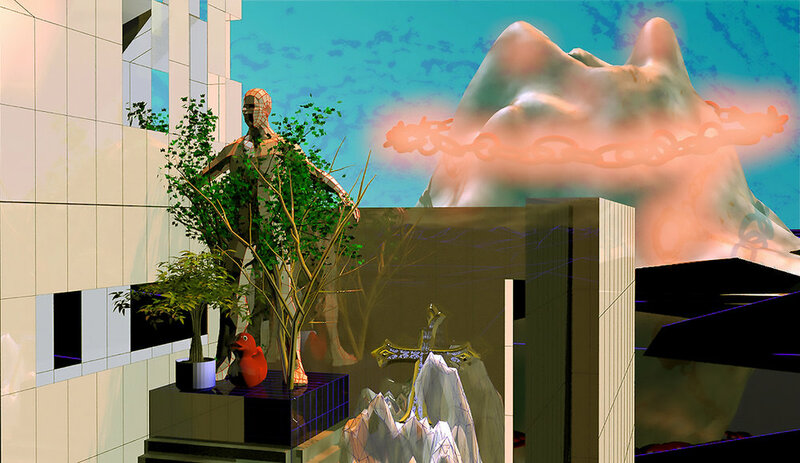 She is interested in the creation of 2D/3D-rendered spaces, forms, and geometries which provoke narrations on the verge of digital and physical. Her work delves into the idea of simultaneity, overlaying a broad spectrum of themes, timelines, and spaces. Papamargariti fragments our everyday experience through the constant diffusion of fabricated synthetic images; a practice that involves merging and dissolving real and virtual elements to build atmospheric digiscapes. Through the manipulation of online presence and complex software operations, she inscribes objects and people’s habitat to highlight our continuous interaction with devices and machinic artifacts. Ultimately, this results in the creation of unique atmospheres and states of being that the artist often invokes using the German term of « Stimmung ». Eva Papamargariti (Greek, born 1987 – ) completed a degree in Architecture at the University of Thessaly before graduating in Visual Communication Design from Royal College of Art, London. She has exhibited worldwide in institutions like the New Museum (New York), the Tate Britain (London), the Museum of Moving Image (New York), MoMA PS1 (New York), Benaki Museum (Athens), Museum of Contemporary Art (Montreal) and Transmediale Festival (Berlin).